In a Nutshell: More than 300,000 women die from pregnancy complications every year, and more than 1 million newborns died globally in the first day of life in 2017. In response, We Care Solar is working to bring lighting and electricity to underserved health care facilities throughout the world with its portable Solar Suitcase. The solar-powered case has all the necessary equipment to meet the needs of most maternal wards in off-the-grid locations. 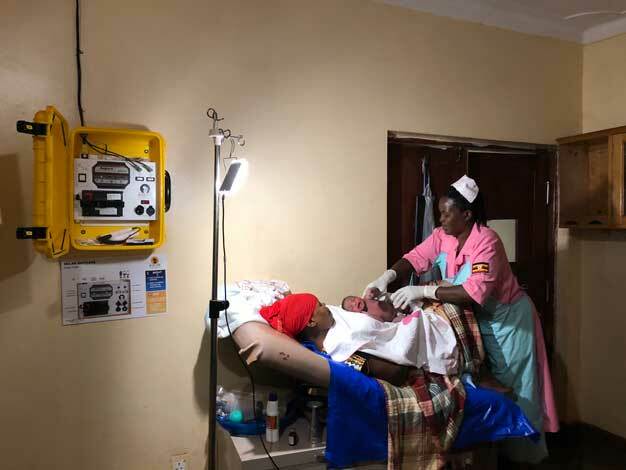 The organization’s Light Every Birth campaign is also urging countries to pledge to ensure their medical facilities have electricity and that no mother must give birth alone or in the dark. Dr. Jacques Sebisaho was born on the remote island of Idjwi in the Democratic Republic of the Congo. Growing up in close proximity to Rwanda, Sebisaho saw the ravages of the Hutu genocide of the Tutsis in the 1990s, and, at times, feared for his own life during the tumultuous and bleak era. Unlike so many others, Sebisaho was able to leave the region and earn a B.A. in Biomedical Science, a Master’s of Public Administration, and a medical degree. Sebisaho has made it his life’s mission to use his medical knowledge and skills to give back to the native cultures in his birthplace. Even today, Idjwi remains an island untouched by many modern conveniences, including electricity. In 2011, Sebisaho was visiting New York and learned about a nonprofit called We Care Solar that had recently developed a Solar Suitcase that brought power to medical facilities in underdeveloped countries. We Care Solar’s mission is to promote safe motherhood and reduce maternal mortality in developing regions by providing health workers with reliable lighting, mobile communication, and medical devices using solar electricity. The organization sent Sebisaho a Solar Suitcase overnight and trained him to use it via Skype, said Laura Stachel, M.D., M.P.H., Co-Founder and Executive Director of We Care Solar. Sebisaho told her that, in the past, he would have lost 50% of his patients during such an outbreak, many of them at night. But, for the first time in the history of the island, no one died of cholera. “We are witnessing what light means to those in need of emergency care after the sun goes down,” Sebisaho told Stachel. In 2013, the World Health Organization reported that, among eight countries in sub-Saharan Africa, only 28% of health facilities had reliable electricity. Stachel’s eyes were opened to the plight of these underserved countries in the mid-2000s when she was conducting graduate school research on maternity mortality and was asked to observe care in a Nigerian state hospital. 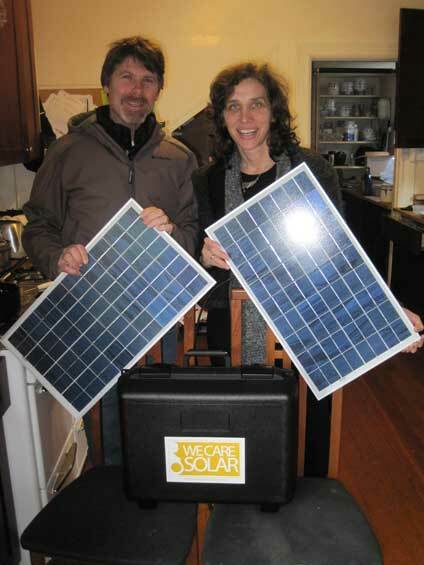 Hal Aronson and Laura Stachel are the Co-Founders of We Care Solar. She said the staff would have to postpone or cancel critical procedures or even turn patients away from the hospital at night. Stachel shared her observations with her husband, Hal Aronson, who was a solar energy educator in Berkeley, California. The couple started We Care Solar to bring light and electricity to places like the Nigerian hospital using Aronson’s background and knowledge in solar power. “We Care Solar envisions a world where all mothers and infants survive childbirth, children thrive, and families have uninterrupted access to quality health care,” according to Stachel. Aronson designed a solar electric system that targeted the maternity ward, labor room, laboratory, and operating theater for the hospital where Stachel was conducting her research. “That system was transformative for maternal health care, and the maternal mortality rate in the hospital dropped by 70% the following year,” Stachel said. We Care Solar’s first solar installation was a clear success, and it wasn’t long before many other health centers in Nigeria, and eventually from all over the world, began asking for solar power solutions of their own. That’s when Aronson designed the We Care Solar Suitcase — a scalable and portable version of his first solar solution. The durable, hard-shell, yellow case provides reliable lighting and essential power to health centers, Stachel said. It enables midwives and doctors to conduct obstetric care without delay, identify and treat complications of pregnancy and childbirth, and monitor fetal well-being before and during labor. A health care worker demonstrates the Solar Suitcase. The portable unit comes with highly efficient medical lighting and power for mobile communication, laptop computers, and small medical devices. The yellow case can be mounted on a wall like a cabinet and the solar panels can be secured to clinic roofs. Each suitcase comes with high-efficiency LED medical task lighting, rechargeable headlamps, a universal cellphone charger, AA and AAA battery chargers, and outlets for 12-volt DC devices. They also include a fetal Doppler to monitor the fetal heart rate during labor. “The basic system comes with 100 watts of solar panels, and a 12 to 20 amp-hour lithium ferrous phosphate battery. An expansion kit is available that provides additional lights and a switch box,” according to the We Care Solar website. 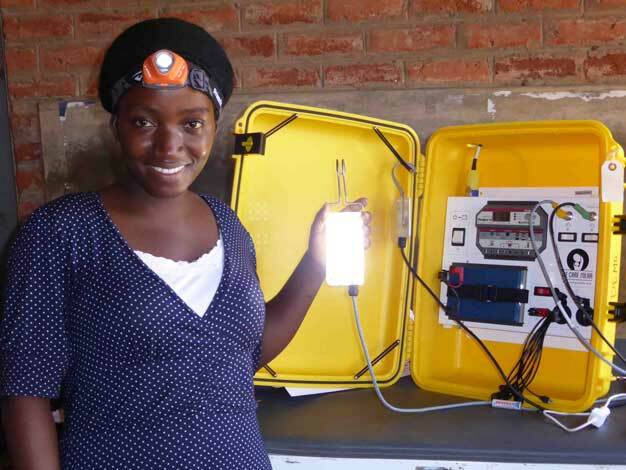 The impact the Solar Suitcase has had in developing countries is impressive. Stachel said there are currently 3,900 health centers equipped with Solar Suitcases across 20 countries. They are being used by more than 15,000 health workers. And, most importantly, the Solar Suitcases have served 3.8 million mothers and newborns. The campaign launched in 2017 with Liberia coming on as the first country to take the Light Every Birth pledge. The country committed to using both grid-tied electricity service and high-quality, medical-quality off-grid systems to equip the 600-plus health facilities in the country. A Solar Suitcase in action, as a health care worker delivers a baby. In late 2018, Uganda became the latest country to join the Light Every Birth campaign. We Care Solar had been working there since 2012. To celebrate the launch, We Care Solar donated 350 new Solar Suitcases to Ugandan health centers in need, with support from the UBS Optimus Foundation, the Wells Fargo Foundation, The Meadow Fund, and the Music for Relief Foundation. “The Light Every Birth initiative will complement our efforts to achieve universal healthcare access and improve maternal and newborn survival in rural communities,” said Jane Aceng, Uganda’s Minister of Health. The latest donations build upon previous We Care Solar efforts that equipped 450 Ugandan health facilities with Solar Suitcases. “We look forward to working hand in hand with our Light Every Birth partners to improve the functioning of off-grid health centers, and to advocate for the fundamental right for all mothers to deliver with reliable lighting and power,” Stachel said in an announcement. We Care Solar has formed partnerships with a number of organizations, and, as a 501(c)3 charitable organization, direct donations are always welcome, Stachel said. The organization accepts donations via credit card, PayPal, or check. Donations can be made as a gift in someone’s name, and We Care Solar will notify them with an e-card. We Care Solar also accepts travel miles from credit card rewards to help fund volunteer travel to the countries they work with. Stachel also highlighted the We Share Solar initiative, which accepts donations to help fund its hands-on STEM education program in which teachers and students participate in the important work We Care Solar is doing across the world.